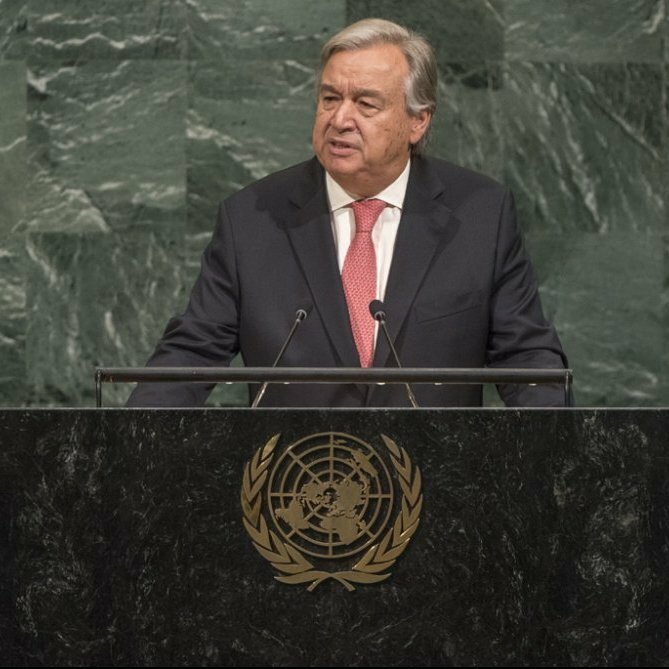 Addressing the annual gathering of world leaders at the United Nations Headquarters, Secretary-General António Guterres spotlighted several threats – including the nuclear peril, climate change, and ongoing conflicts – that must be overcome to create a better world for all. “We are a world in pieces. We need to be a world at peace,” said Mr. Guterres as he presented his annual Report on the work of the Organization ahead of the general debate of the UN General Assembly, in which Heads of State and Government and other high-level representatives from around the world discuss key global issues. He said that the world is seeing insecurity rising, inequality growing, conflict spreading, climate changing, societies fragmenting and political discourse polarizing. The UN chief noted that global anxieties about nuclear weapons are at the highest level since the end of the Cold War due to provocative nuclear and missile tests by the Democratic People's Republic of Korea. “The solution must be political. This is a time for statesmanship. We must not sleepwalk our way into war,” he warned, as fiery talk can lead to fatal misunderstandings. On terrorism, the Secretary-General stressed the need to address the roots of radicalization. “It is not enough to fight terrorists on the battlefield,” he said. Stressing the need for “a surge in diplomacy today” and “a leap in conflict prevention for tomorrow,” he said that it is possible to move from war to peace, and from dictatorship to democracy. Only political solutions can bring peace to the unresolved conflicts in Syria, Yemen, South Sudan, the Sahel, Afghanistan and elsewhere. That was why he announced the creation of a high-level advisory board on mediation, he added. On Myanmar, Mr. Guterres said the Asian country's authorities must end the military operations in Rakhine state, allow unhindered humanitarian access, and address the grievances of the Rohingya Muslims, whose status has been left unresolved for far too long. He went on to take note of State Counsellor Aung San Suu Kyi's address today – and her intention to implement the recommendations of the Advisory Commission on Rakhine State that was chaired by Kofi Annan within the shortest time possible. On the Israel-Palestine conflict, the two-state solution remains the only way forward, he said. Turning to climate change, Mr. Guterres urged Governments to implement the historic Paris Agreement with greater ambition. “We should not link any single weather event with climate change. But scientists are clear that such extreme weather is precisely what their models predict will be the new normal of a warming world,” he said, noting that mega-hurricanes, superstorms and rain bombs are added to the vocabulary to describe what is happening. While explaining how globalization and technological advances have brought uneven benefits, he also highlighted the dark side of innovation, such as cybersecurity threats as well as the possible negative implications of artificial intelligence and genetic engineering. “We call ourselves the international community; we must act as one,” he concluded.